Εναέριες είσοδοι και καλώδια Υπάρχουν 5 προϊόντα. 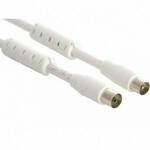 Aerial cable for use with ordinary aerial devices, generally radios or TVs. The cable is made from high-quality materials, ensuring optimal signal quality without noise and interference, specially optimised to produce a razor-sharp picture on your flat screen TV. 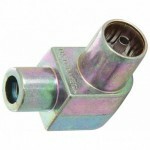 Aerial connector for fitting to the end of an aerial cable. External screw terminals avoid the need for soldering. The connector is angled at 90 degrees so that the cable does not stick up in the air.